On the heels of their recent lithium ion drill driver combo release, SKIL is back at it with two brand new offerings in the woodworking / capentry department: the RAS800 and RAS900 Smart Design Router Tables (official site). SKIL let us test drive the nicer of the two tables, the RAS900. After using the tool for one Sunday afternoon, we think their design is, indeed, smart. It’s so smart, in fact, that it made us feel a little more like professional carpenters even though we don’t do woodworking jobs on a regular basis. 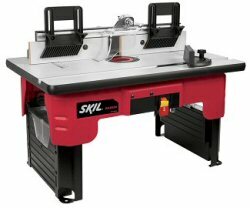 Both of SKIL’s router tables were designed for the junior and mid-level woodworker–someone who wants the capabilities of a router table without the usual $300-500+ price tag. As a bonus, for those of us without much tool storage space, both tables fold to less than 10 inches high and store neatly on a workbench or garage shelf. Keep reading below for our full review. Getting started with SKIL’s RAS900 table was a pretty simple task. Total setup time was about 30 minutes, and most of that time was spent understanding all of the components that ship with the table and how they work together to perform various routing tasks. The first major step after unpacking: mount the router. Mounting a router: To mount a router, the table features a quick clamp mount and mounting plate designed to be compatible with all major routers (we used a 1-3/4 HP fixed-base SKIL Router). The picture sequence below shows the mounting plate on the router and the quick clamp bracket on the underside of the table. Once you get the hang of router installation and removal, the task can be accomplished in under 10 seconds. Installing and removing bits requires the router to be removed from the table due to the plastic and metal skirting, so the quick-change mechanism is much appreciated. 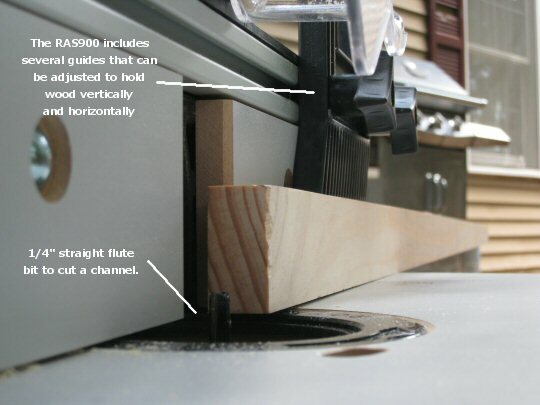 Adjusting Router Height – Once the router is in place, the height of the router bit is adjusted using the router itself (rather than the tabl). 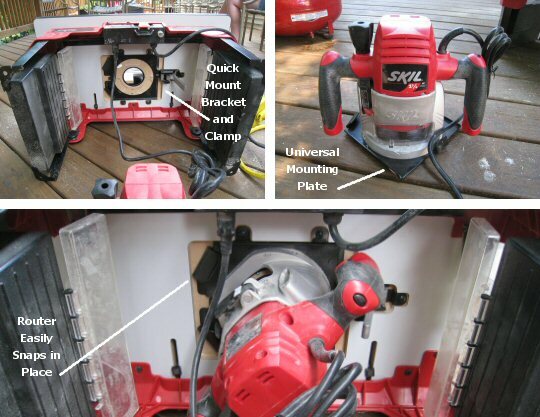 The SKIL fixed-base router includes both a rough and fine adjustment mechanism to get the bit to the correct height. Some more expensive tables include an automatic lift mechanism, which is a nice feature but costs hundreds more. Performing a Channel Route – From opening the box to performing our first route took about 45 minutes. We set up the table to cut a channel using a 1/4 inch straight flute routing bit. The RAS900 includes vertical and horizontal guides that ensure the wood is held tightly in place. Trying Various Edge and Channel Routes Together – We swapped bits in and out and turned a 5 ft. piece of maple several times to see how complicated of a look we could create with a few simple edge and channel routes. We were pleased with the results, which were very uniform. Smoothness was not perfect; however, that has much to do with the bits we employed. 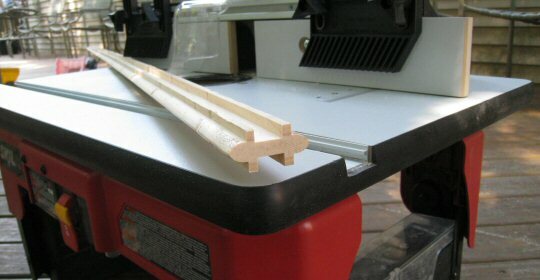 Making Simple Edge Molding: Finally, we decided to try our hand at putting a simple Ogee edge on a piece of 5 ft. stock. The results were very good for the pretty simple route, resulting in a smooth, uniform cut. Note that we had the bit lowered too far down into the table, so while the results were uniform, we effectively highlight the need to try a test board to confirm the router settings before routing your boards! Performing More Complicated Routes: We’re planning to use the router table to make more complicated channels and routes, including building a coffee table and designing some custom molding using larger, fancier bits. After test driving the RAS900, we’re confident it will be up to the task. We think the SKIL RAS900 makes a great addition to an amateur or occasional woodworker’s shop. It offers a great combination of affordability and capability that is tough to beat in the router table market. Integrated Power Strip (to control router and dust collection power from the table). What do you think? Do you own the RAS800 or 900? Leave a comment below and let us know your experience! I read your review on the Skil RAS900. Sounds like a nice table. The review mentions that it accepts most major brand routers. I have a Bocsh model 1617. Is my router compatible with the RAS900? I checked the Skil website and saw no mention of which routers are compatible. Greg, unfortunately, I am not sure if it is compatible. The plate is designed to accept most fixed-base routers, so it probably will work. Suggest giving SKIL a call. Bosch actually OWNS Skil now, so it wouldn’t surprise me if (1) it was designed to work with a Bosch Router and (2) if the customer service might not be able to tell you the answer. Good luck! Haven’t been able to find out if this RAS900 will work with the newer Skil 1830 router. Lowe’s told me somebody returned one saying the router wouldn’t fit the table. This would be a shame. I bought a higher-priced Bosch 1617 and table, but there were features of the Skil table and router that were very attractive – lower price, swiveling tool guard on the table, clear baseplate, and the LEDs on the router. Also the Skil table is bigger and folds for storage. Very nice, Skil – but the RAS900 doesn’t list the 1830 as being compatible – and no other table is offered. What gives? Greg, first of all thank you for the help in getting me familiar with my new Skil RAS900 table and 1830 router. You were very helpful. TCJ, yes the 1830 router does fit very well. The person that had a problem probably tried to make it work with the plunge unit attached and that will not work. Just use the base and follow the instructions. I’m a novice and while I had to read the instructions a couple of times because I didn’t know a base clamp lever from a base release button, I was able to get everything running in about an hour. Porter Cable 690, 7529 Plunge, 892-895 Series of fixed base only. Nick – Thanks so much for adding this. Really appreciate it! This is pretty small, about 10-15 lbs. or so max. Does anyone know if I can order just a “Quick-Clamp Router Mounting Plate” for the RAS900 router table? You’re going to want to contact Skil customer service for that. I am trying to use a Skil 1825 with this table and while the router fits fine the bit moves in towards the fences the more the router is adjusted upwards. For multiple passes this means that one edge is stair step inwards and the other edge, while smooth is not centered with the previous passes on the other edge. I feel certain this is actually an issue with the router but it sure seems odd that a Skil router in a Skil router table has such a major flaw. It makes the table unusable and has been a serious disappointment for someone who is just getting started with routing (the target audience for this equipment). I have an RAS 8000. Can’t get my Skil 1825 base mounted to the plate in a way that the router arm does not interfere with the closing lever of the plate lock. I aligned the holes in the router base to the plate holes lettered “A” in the manual for Skil routers. No luck. Any suggestions? Where can I get replacement parts for the Skil rsa 900? I need to replace the quick mount assembly. Having used this router table. Not much to tell, however the accessory boxes are poorly designed and very hard to open. Fred, I’ve encountered one difficulty with the Skil RAS900 router table; the metal plate surrounding the bit is not flush with the table, which makes height measurements extremely arduous. Nor is my plate parallel with the table, which would help a great deal. Have you or your “network” partners discovered a way to position the black metal plate flush with the table-top? Did you receive info on how to even the black plate with table? i have a skill router m#1823 will it work on my new just bought ras900? Well, reading this review http://oydeals.com/bosch-ra1171-cabinet-style-router-table/ can be good as it contains true information on this Bosch router table! Hi, I have an old Skil 1810 router. (prior to 1982) Will this old router work with this Skil table? Will I need to purchase additional components to make the attachment to the table, as all I have is the router with the bottom plate on it. I do have a skil router bit set. Thanks. Can this router table be adjusted from above? If not is there an accessory available that would make this possible?